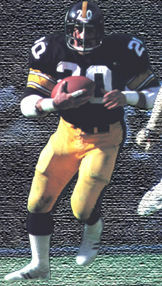 Robert “Rocky” Bleier remains one of the most popular of the Steelers Super Bowl champions. He was adopted as one of Pittsburgh’s finest citizens. Fans have always liked him and identified with him for many reasons. They thought he was one of them. For starters, at 5-9, 210, he was on the small side for a pro football player. He wasn’t especially fast. He was handsome, but balding. Imperfect, like most of the fans. He was from Notre Dame, where he had been a member of the 1966 national championship team, and the captain of the football team his senior season. He was Pittsburgh’s 16th round draft choice in 1968, so he was an underdog. His hometown was Appleton, Wisconsin, where he lived upstairs of his dad’s saloon – just like Art Rooney did in his youth – yet the fans could see him as the boy next door, the kind of guy they would like their daughter or sister to marry. He wore a mustache, and there was always a ready smile under it. He was quick to shake your hand, and it was a firm but not overdone grip, and he would give you an autograph and, seemingly, the cape off his back. He seemed too good to be true. He had done his duty, and gone to Vietnam. He was wounded there and had come home with a limp. But he worked hard and, after struggling for several seasons to find a spot on the Steelers’ roster, he became one of the contributing stars to all those championship seasons. He came through in the clutch so many times. Steeler fans still talk about high he jumped – higher than he should have been able to jump – to catch a pass in the end zone to nail down the Steelers’ third Super Bowl victory. He finished his career as the fourth leading ground gainer in team history even though he only had five 100 yard games. He blocked for Franco Harris, he did little things well, and he could pick up tough yards in tough times. He seemed like the kind of guy who’d give up his body for a buddy. On a battlefield or a ballfield. He was indeed, an All-American boy, if not an All-American football player. “I’m a breathing example of what you can do if you want to,” Bleier told writer Rick Telander in an August 11, 1986 story for Sports Illustrated. 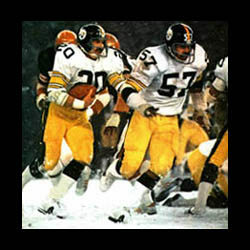 Philadelphia had its Rocky in Sylvester Stallone, and Pittsburgh had its Rocky in Robert Bleier. Pittsburgh’s Rocky was reliable and durable, playing twelve seasons with the Steelers, interupted early on by an overseas stint in the military service. He was selected as one of the ten outstanding yound men in America by the Jaycees in 1979. He was named the NFL’s Man of the Year for the 1980 season, his final campaign. 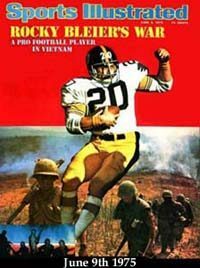 After his rookie season with the Steelers, Bleier was drafted and shipped off to Vietnam. On August 20, 1969, his platoon was ambushed in a rice paddy near Chu Lai, and Bleier was wounded in his left thigh. 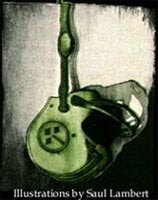 While he was down, a grenade exploded nearby, sending pieces of shrapnel into his right leg and foot. When Bleier was recovering in a hospital in Tokyo, he remembers receiving a postcard from Art Rooney. “I was pleased he took the time,” said Bleier. “The card said something like ‘We’re still behind you. Take care of yourself and we’ll see you when you get back.’ That was nice.” Bleier reported to the Steelers’ training camp in 1970 and was 30 pounds under his previous playing weight. He could not walk, let alone run, without pain and a noticeable limp. He was waived on two different occasions by Chuck Noll, but would not give up, and hung around until he had a chance to reclaim a spot on the roster. In 1974, after a weightlifting programme had bulked him up to 212, he made his opening. He rushed for more than 1,000 yards in 1976 and caught the decisive touchdown pass in Super Bowl XIII. “It was not hard for me to come back as a ballplayer. It was the road of least resistance. The same was true of me going to the army in the first place. What were my options? Go to Canada? Get into the reserves? Injure myself? Ask for status as a conscientious objector? I couldn’t get into the reserves. I got drafted. I go." “I was the leading ground gainer in the preseason for the third year. But I ended up playing special teams again. The backfield pairings worked out just the way I had figured. I didn’t play in the backfield in the first two games against Baltimore or at Denver. We beat Baltimore 30-0, but Franco got injured and couldn’t play, and Frenchy went in at fullback with Davis. In the second game, we tied Denver, 35-35. Joe Gilliam was the quarterback. We lose the next game at home against Oakland (17-0). In the fourth game, at Houston, the offense was doing fine with Bradshaw at quarterback, but just before the half, Frenchy got dinged and Chuck puts Preston and I in there together. I’m the fullback. Preston breaks one and went in for a touchdown from 47 yards out and we win (13-7). In the next game at Kansas City, I start at fullback with Preston at halfback. Preston had another big game, God bless him, and we win (34-24). Now Franco is healthy, and Chuck puts Franco back in at fullback and I’m back to being a swing back. We beat Cleveland (20-6). Story and images from Sports Illustrated.